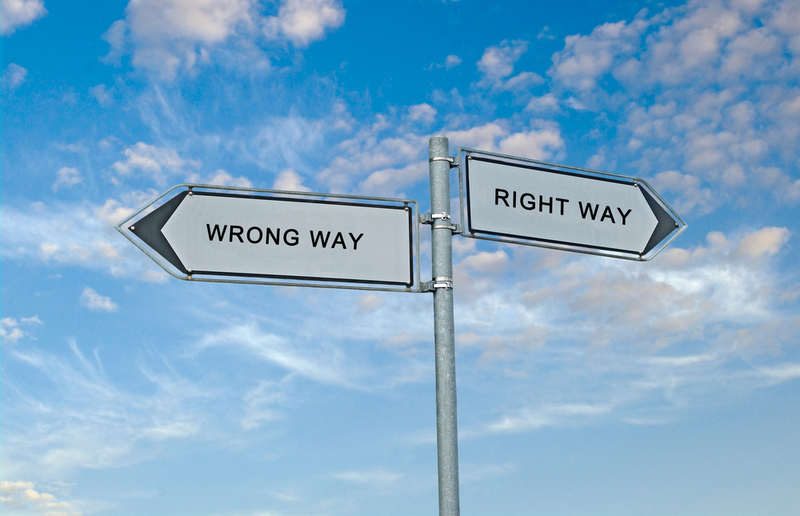 We are faced with deciding between right and wrong on a daily basis. When discussing ethics you can surely argue for hours why one choice is better than the other. Despite this plurality of worldviews in ethics, there are areas in life where there cannot be any discussion about wrong or right. There is just a wrong way and a right way. The field of internal logistics can be used as a good example, showing off how apparent the gap between wrong and right can be. Here are the wrong and the right ways to organize internal logistics processes. People involved in internal logistics are responsible for a secure production supply. So obviously, it is wrong to transport material in a manner that does not allow for punctual production. But to be fair: it is not easy for internal logistics managers to always organize the internal transports in a timely fashion. This is due to different factors that add complexity to the planning of internal logistics. Instead of central control or pre-determined plans to manage the transports, the drivers of the various transportation means such as forklifts or tugger trains usually receive their tasks either over the phone, are instructed directly from a colleague, or they drive around searching for material that may need to be transported. Because of this, an overview of material movements is missing as there is no set system designated for the documentation or tracking of the materials. Consequently, no information about the current transport situation can be provided. In a worse-case scenario, the lack of transparency can lead to lost material and, as a result, a costly production shutdown. There is enough stress and delays involved with external supplier shipments, but to lose material inside one’s own four walls can be even more frustrating, like losing your keys when you are already late for work. Without a certain level of transparency, reaction times for unplanned transportation requirements, such as urgent orders, will not be fast enough to ensure timely production. Many unnecessary, inefficient trips are the result. Obviously wrong! Besides these terrible consequences, it is also wrong not to know how many transports and trips your drivers are making during their workday in the plant. In a time of increased drones and robotics, nobody should call or search for their colleague to receive instruction or just drive around without a proper plan. Calls and chaotic searching are not the way modern production plants should work. The right way looks much different. It should be ensured that all transports are planned in real-time for a secure production supply. Logistics managers should have an overview of all ongoing transport orders at all times. The resulting transparency will soon point out where resources are not used efficiently and where transport trips can be shortened, reduced or eliminated. Although some plants are still organizing their internal transports the “wrong way”, there are also examples of companies that already started optimizing their internal transports. For example, the German-based steel producer Dillinger. If you have ever worked in a steel production facility you know: There are many internal material transports. These include the supply and disposal of raw materials, the transport of intermediate products and the removal of the finished goods, all of which require optimized logistics processes and movements. Furthermore, the transported material is often slags or bulk material, which require special handling during the transport. To create cost-efficient processes, the company implemented a central system to track all material and organize all internal processes. The company soon noticed a positive impact through shortened lead times, an optimized utilization of resources, and a reduction in driving distance. These gains in efficiency also allowed for improved timeliness. The transparency of the transport processes simplifies the work of the dispatchers, as they have better situational awareness and can, in turn, leverage more control over the internal transports. Now, Dillinger can process its heterogeneous transports with minimized use of personal and transport means. In internal logistics processes, there is a right and a wrong way of organization. The right way helps create a detailed overview of all transport situations. Information on transport orders, appointments, status and capacity is stored centrally and is available to be accessed anywhere, at all times. Logistics managers can feel the difference in less complaints from the production, lower costs, happier drivers and a well-organized production plant. So why not try it that way? How do you organize your internal transport orders? Luisa Walendy started working for INFORM in 2015 and has a strong interest in the topics of manufacturing and logistics.